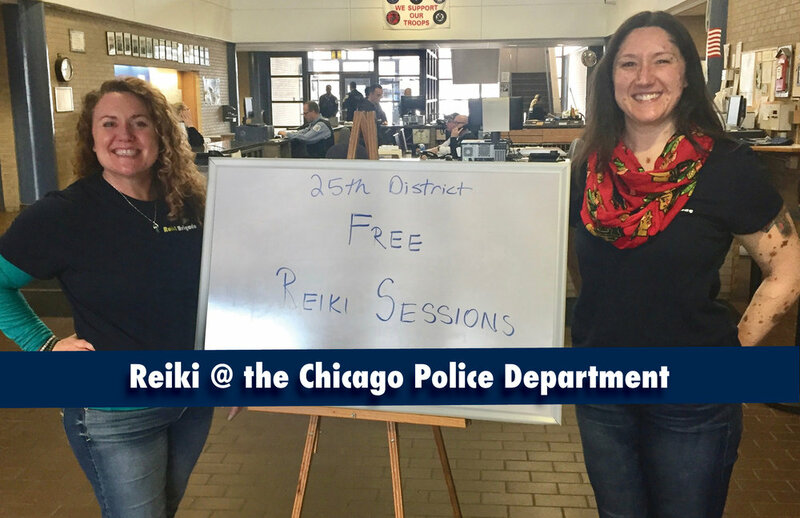 As officers and brass communicate with each other about their positive experiences with the Reiki Brigade, we have been invited to more and more locations. Unbeknownst to us, one of the officers put this sign right inside their front door so everyone arriving for work would be reminded to come check reiki out before their shift. Thanks for the promotional boost, folks! This last effort was special because it was the first time out for two brand-new volunteers, Meghan and Kim, both dear friends of mine. I'll let them tell you how it went. That was great! I was able to provide reiki to eight officers and staff, half of whom had never even heard of reiki before. It was wonderful to see so many people open minded enough to try it and enjoying the experience. I loved raising the vibe with people who deal with so much trauma on a daily basis. And because Heather had said that we should create as serene and healing an environment as possible—accommodating all five senses—I brought my bergamot essential oil. To set up our space in the community room, we turned down the lights and played soothing spa music, and then I sprinkled a couple drops of bergamot around the space. Bergamot is reported to alleviate anxiety and promote calm, so it seemed like a good choice for the event. The first person through the door said it felt really nice in there, different than usual. No one else really commented on the ambiance, but then two officers came back in after their session to ask what the scent was. They were both really drawn to it and wanted to get some for their personal space. I'm really glad I decided to bring it and was able to contribute to everyone's experience in this way. Kim is a veterinarian who connects with animals on deep levels. The more I think about yesterday, the more I'm so overwhelmingly happy about it! My first officer came in and asked, laughing, "Is this the torture chamber?" because he was uneasy about what was going on. When asked if he knew what reiki was, he confessed to Youtubing it so he could see what we were doing. After his session, I could tell from his face that he was blown away, but didn't want to admit it. He said it was really relaxing and he almost fell asleep! A female officer I worked with said she was so excited and I could tell that this was the "right time" for her to experience reiki. As I was working on her, my hands were getting pushed away, releasing "stuff" she had been holding onto. At the end she wiped her eyes, and I'm not sure if she was crying or just so relaxed her eyes were watering... I believe it was the former. The two officers who came in at the end were extremely hesitant. They only came because the first officer (mentioned above) strongly encouraged them to try it. The officer I worked on said more than once how relaxed he felt after. You never know if people are just telling you what they think you want to hear, but as they both passed through the door on the way out, I heard him say to the other guy again how great and relaxed he felt. Overall the feedback was extremely positive. Everyone was very polite, seemed very open to it, and thanked me multiple times. I think they were also thankful that people were looking out for them and reaching out to them instead of jumping on the cop-hating train. It was a really great first experience for me and I definitely want to do more. I will feel much less nervous after getting so much positive feedback. This has really sparked my desire to get involved more, and also—because you know me—I'd love to be able to work with canine officers and/or war dogs and their partners. I couldn't have said it better myself. We'll definitely look into the canine reiki thing.